Do your kids have a trampoline? Maybe they aren't using it as much as they could. I know my kids will jump for a while, but then get bored. I decided they needed some really fun ideas to keep them outside this summer!! I just hope they don't play so hard that we get another rip in our trampoline enclosure!! Thank goodness I know how to fix these holes in the netting myself, LOL! 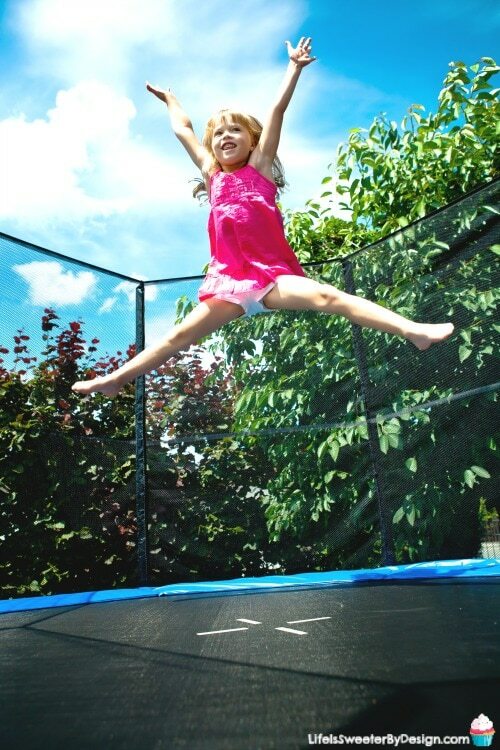 Here are 10 trampoline games for kids that will keep them HAPPY and tired this summer! I found a big foam dice and knew it would be perfect for a trampoline game. My kids use the dice to do various games. They take turns rolling the dice and then they have to do that number of jumps. So they decide on a jump and then roll. If they land on a 5 then they have to do 5 tuck jumps, etc. There are tons of variations they can come up with too! I like that the dice is foam and won't hurt them. Our trampoline has a basketball goal attached to our trampoline enclosure. If your trampoline does not have a goal attached….you can buy one!! It is really easy to attach to your enclosure. This one is made of soft materials for safety and comes with a mini basketball too. Trampoline basketball is great for all ages because even small kids can JUMP and make a goal! Hot Potato is a game that has been around forever and is too fun to forget. Grab a soft bouncy ball and some music to get started. One child will be in charge of the music. The other kids will be in a circle on the trampoline. When the music starts the kids will throw the ball to each other pretending it is HOT. They want to catch it and throw it to someone else as quickly as possible. The child in charge of the music will turn it off suddenly. Whoever is holding the potato (ball) will be out. If you drop the ball you will also be out. Keep playing until there is only one person left. I remember playing this game as a kid, but it didn't have a name, LOL. Dead Man is played with one child sitting in the middle of the trampoline with their eyes closed. This child counts to 10 and then someone says, “dead man rise”. The child in the middle will then crawl or roll around on the trampoline with their eyes STILL closed. They will try to touch another child who is trying to avoid them. The other kids cannot jump over the dead man, but can move around him other ways. When someone is touched they become the dead man and the game starts over. Most kids have played Simon Says at some point. It is kind of like a rite of passage during childhood. Playing Simon Says on the trampoline makes the game even more fun. The child who is Simon is actually outside the trampoline enclosure on the ground. They make the calls from the ground and watch the other kids do funny tricks and stunts. The child that is still standing at the end gets to be the next Simon. Put several balls of any size on the trampoline. The kids will start jumping and will try to keep from touching any of the balls. If a ball touches them they are out and have to sit down. The last kid jumping will be the winner. My girls have always like playing hopscotch. Jumping on the trampoline doesn't have to stop them either. They just grab some sidewalk chalk and draw the hopscotch board. Then they usually use a small bean bag or stuffed animal to throw instead of a rock. Playing this on a trampoline adds a whole new layer of fun. We have so many laughs when we play monkey in the middle. It is even funnier when we play it on the trampoline. If you have never played it is a very simple game. One person is the “monkey” and they are in the middle of the trampoline. The other players throw a ball around and try to keep it away from the monkey. If the monkey gets the ball then the person they got it from becomes the monkey. Duck, Duck, Goose is a simple children's game, but it is actually kind of addictive when you play it on a trampoline. Running around the circle on the trampoline is FUN! Will the goose catch the duck?? Dance Party is exactly what the name says…a dance party! Turn up some upbeat fun music and dance/jump. See who can dance the longest. Take turns dancing and stopping when the music turns off. A dance party on a trampoline will make your kids sleep good tonight! 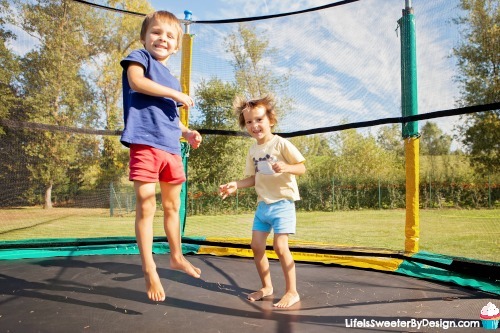 What Are Your Favorite Trampoline Games for Kids? 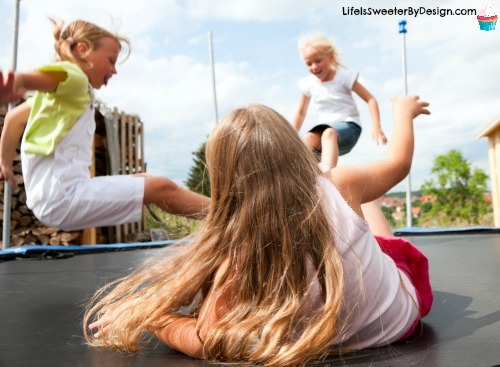 Does your family have any favorite trampoline games for kids? Be sure to check out all my fun Kid Approved Activities for more awesome ideas!